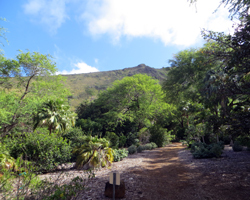 Koko Crater Botanical Garden: Scenic Hawaii Stroll inside a Volcano. 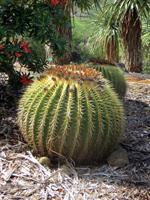 The Koko Crater Botanical Garden is one of the five City and County of Honolulu botanical gardens that you can enjoy during your Hawaii vacation – and it’s one of the free ones. What makes this Oahu Hawaii attraction unique among all the many fine Hawaii botanical gardens is that it’s the only one located inside a volcano crater and dedicated primarily to arid climate flora. All the other Oahu botanical gardens are lush, green, and more tropical-feeling; and the neighbor island gardens with which I’m familiar are similar. 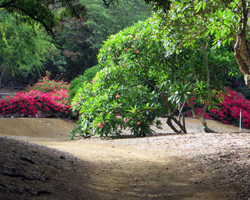 Now, personally, I prefer the tropical rainforest type of gardens; but the fact that they’re more common here in Hawaii is precisely what makes the Koko Crater Botanical Garden a worthwhile and out-of-the-ordinary Oahu tourism experience. I should clarify, however, that even though this Hawaii activity has a Honolulu zip code, it’s nowhere near the city-proper. It’s located out in the Hawaii Kai area of East Oahu near Hanauma Bay, Sandy Beach, and the Makapuu Lighthouse – approximately 21 km (13 miles) from the middle of Waikiki. Furthermore, I’m tempted to call the Koko Crater Botanical Garden a bit of a hike, but the county calls it a garden, so I’ll stick with that. Nevertheless, you’re going to want to wear good walking shoes, because you’ll be walking on more than 3 km (2 miles) of unpaved and uneven paths encircling the 60 acre garden. This is a self-guided tour that can take 1.5 hours or more. You’ll want your feet to be comfortable and protected. And don’t ask why I know this… but if your flip-flop rubbah slippah breaks at the half-way point, you’ll be in for an unpleasantly rocky and thorny return trip (or one heck of a long hop). One of the most remarkable characteristics about Hawaii is that our islands have nearly every climate type – from coastal to mountainous, tropical rain forests to arid deserts and snow-capped mountains (on the neighbor islands). 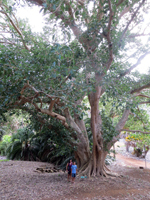 And the various City and County of Honolulu botanical gardens are strategically scattered about the island of Oahu to showcase much of this diversity. Geologically speaking, Hawaii exists only because of our volcanoes. As a result, they’re some of the most iconic landscape features in the state, and they’re largely responsible for the diverse climatic conditions. 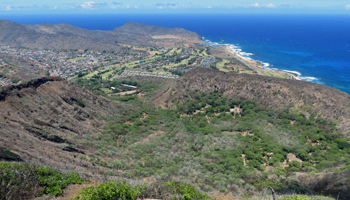 Thus, it makes perfect sense that one of our Hawaii botanical gardens should be located inside the dormant Koko Crater. 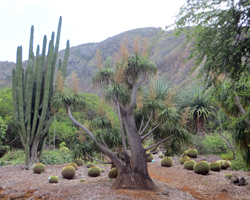 The Koko Crater Botanical Garden is located in one of the most arid desert-like parts of Oahu. As a result, they’ve used xeriscaping methods to cultivate rare and endangered dryland plants. You can see an assortment of African and Madiscan plants, cacti and succulents, plumeria and bougainvillea, dryland palms, native Hawaiian wiliwili (will-ee-will-ee) and ilima (ee-lee-mah), and more. Depending where in the world you’re from, some of this may not seem that exotic. But I’ll go out on a limb (no pun intended) and guess that you probably don’t have most of this collection growing near you. 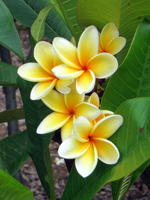 If you’re most attracted to the brilliantly colored tropical flowers, the plumeria and bougainvillea groves are within approximately 100 meters of the entrance. You can just take a quick stroll through there and then get on with the rest of your scenic Hawaii sightseeing. 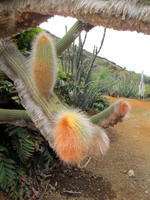 If, however, you’re particularly interested in the native Hawaiian flora or the exotic dragon’s blood tree, you’re going to have to walk the full trail just to get to the far side of the crater where these are growing. I’m writing this in December; and that means Christmas. If you’re like me, you may have grown up hearing the story of how Magi brought the baby Jesus gifts of gold, frankincense, and myrrh. 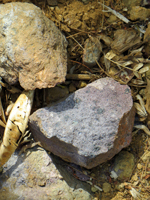 The Koko Crater Botanical Garden has myrrh. You can see it for yourself. And maybe you’ve also heard about when short Zacchaeus the tax collector climbed a sycamore fig tree to see Jesus as he passed through Jericho. I don’t think they’ll appreciate if you try to climb it, but this garden also has a sycamore fig tree. It’s a lot bigger than I imagined it would be. In Solomon’s Song of Songs, he compared his beloved to a garden growing – among other things – myrrh and henna. Henna is here. I realize that you go to a botanical garden for the plant life. Duh. But this one is located inside a volcano. Take a look at the rocks while you’re there also. They’re not just uniformly black lava. I was especially intrigued by some of the rocks that are a distinct shade of violet/purple. I don’t think I’ve seen rocks this color anywhere else in Hawaii, and I haven’t been able to figure out what combination of minerals causes them to be that color. There are no permanent facilities on site… No welcome center. No gift shop. No cafeteria. Not even a water fountain. And there’s no restroom other than a porta-potty. So relieve yourself before you arrive and pack some drinks. Beyond that, the standard rules and common sense apply... No dogs (or any pet, I suppose). No bicycles. No littering, lighting fires, or picking/eating the plants.